Water splitting inPEM electrolyser is an efficient way to produce hydrogen. If electricity is generated from renewable energies green and CO2 free hydrogen can be produced and stored for later usage in many applications. Among others hydrogen can be used as fuel for fuel cell vehicles. 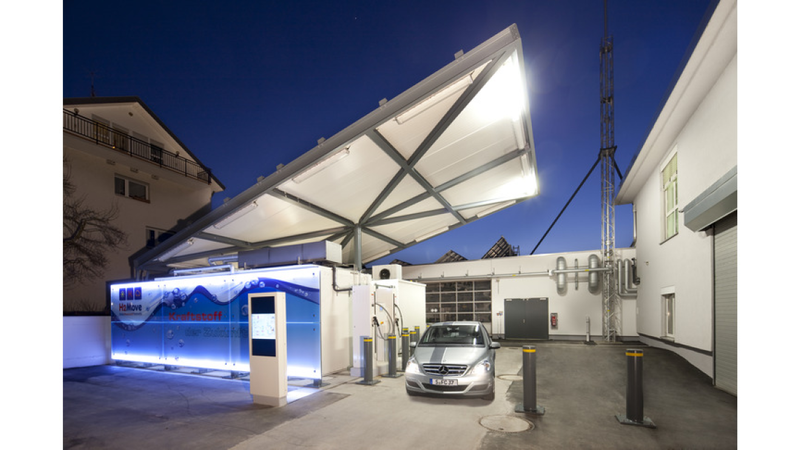 Recently Fraunhofer ISE has open a solar hydrogen filling station in Freiburg/Germany in which a PEM electrolyser produces hydrogen with the helps of photovoltaic moduls. With two daimler F-CELL fuel cell cars we demonstrate how a sustainable mobility can look like in the future. In general Fraunhofer ISE develops and designs stacks and systems for PEM water electrolysis for a broad range of applications.